Years of experience manufacturing parts for steel melting arc furnaces, such as roofs, preshaped parts or spouts , guarantee Deguisa as a manufacturer with quality and experience in the sector. Deguisa supplies a wide range of products that include tamping dry masses, conventional concrete of low cement content (LCC) and ultra low cement content (ULCC) at the same time providing extensive experience in this field. Deguisa covers the full process from the study and design of the pieces to the manufacturing in a controlled way. These pieces facilitate the day by day of the client since these are easy to install and it is not needed personnel or specific machinery. In addition are delivered predryed, ready for starting-up. In addition, Deguisa offers furnace repair materials in the hearth and wall of the furnace that allow improving the life of the refractories. Design adapted to each installation for optimization of performance and cost of the roof. Adaptation to existing installation and steelcase. Quick and easy installation, without machinery and specialized personnel needed. Pre-assembled pieces delivered ready for use, avoiding long periods of commissioning. 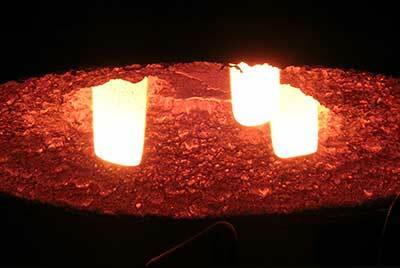 Do you need more information about Electric arc furnaces refractories or about other products or services? Send us your details and we will contact you.